This four drawer chest features easy glide drawer slides and spacious drawers (21.75" W x 16.375" D x 5.25" H) to hold the essentials of everyday life and more. This chest is sure to please while taking up a minimum of your home's floor space. Handcrafted in Montana using solid, U.S. grown wood and finished in the "Glacier Country" collection style for a truly unique, one-of-a-kind look reminiscent of the Grand Lodges of the Rockies, circa 1900. First we remove the outer bark while leaving the inner, cambium layer intact for texture and contrast. Then the finish is completed in an eight step professional spraying process that applies stain and lacquer for a beautiful and long lasting finish. 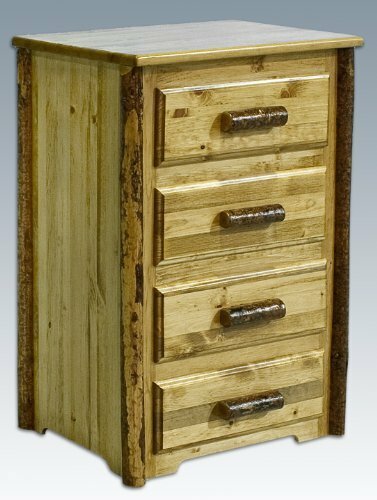 These chests of drawers are true heirloom quality; designed and built to last a lifetime. Comes fully assembled. 20-year limited warranty included at no additional charge. 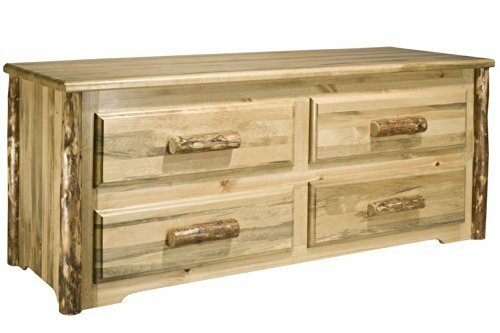 These beautiful dressers are hand crafted by 5th (going on 6th) generation woodworkers to compliment our Rustic Log beds and Bunk Beds. 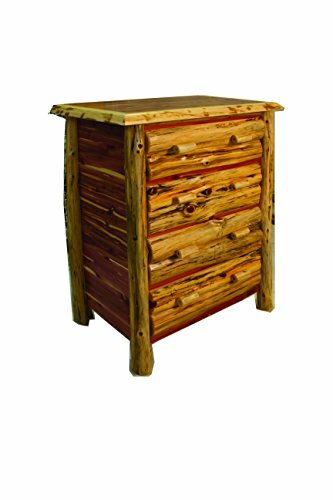 They ship fully assembled unlike other Midwestern log furniture manufacturers. We have been building and shipping Rustic Log furniture for many years. Our dressers have "Euro" Ball Bearing drawer slides for super easy smooth action. We have shipped thousands of our beds and dressers all over the US and Canada. We ship fully insured via FedEx. You can choose our natural unfinished option that you can stain and finish coat yourself, or our lacquered option for a beautiful clear protective finish when it arrives at your door. 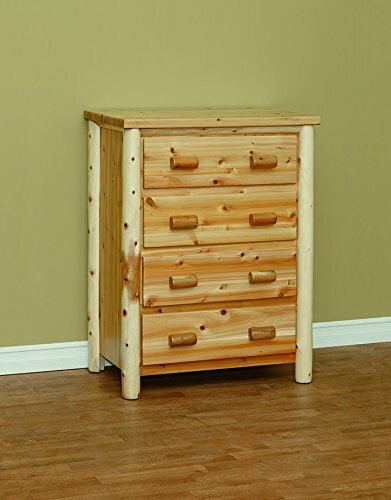 The four drawer chest of drawers from the Homestead Collection is handcrafted in Montana using genuine lodge pole pine. Distinctive square sawn corner trim and drawer pulls accent the dresser and drawers. The spacious drawers feature epoxy coated steel 'easy glide' slides with nylon rollers for ease of use and increased longevity. Timbers are square sawn for a unique timber frame/barnwood appearance. This item comes ready to finish so you can match existing decor styles and colors; simply lacquer or stain and lacquer to match. Comes fully assembled. 20-Year limited manufacturer's warranty included. 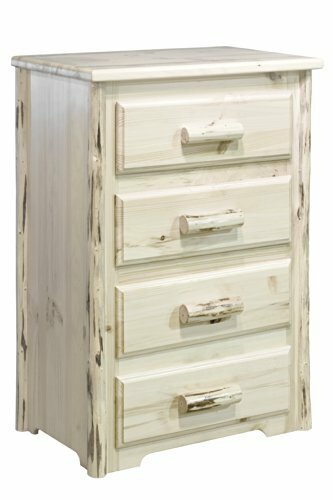 The four drawer chest of drawers from the Montana Collection is handcrafted in Montana using genuine lodge pole pine. Distinctive log corner trim and drawer pulls accent the dresser and drawers. The spacious drawers feature epoxy coated steel 'easy glide' slides with nylon rollers for ease of use and increased longevity. Skip peeled by hand for a distinctive, one of a kind appearance. This item comes professionally finished with premium grade clear lacquer. Comes fully assembled. 20-Year limited manufacturer's warranty included. 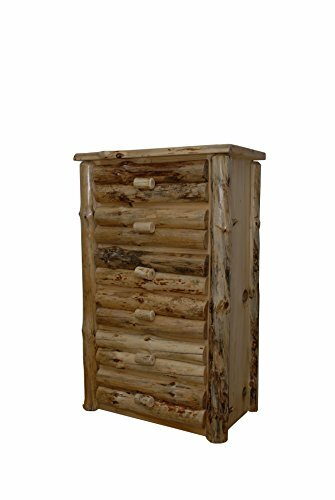 Mountain Woods Furniture functional art from nature to serve your storage needs. 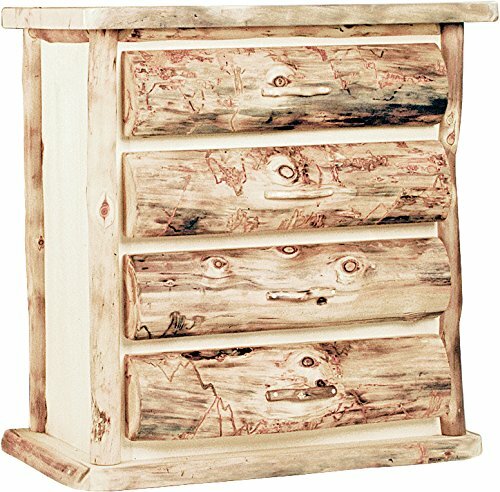 Featuring a two inch thick solid wood top, the Aspen Heirloom chest also features smooth glides, dovetail drawers and a solid skirt base, it is sure to be an heirloom piece for years to come.Every piece is made to order, using the finest sustainably sourced wood direct from the Rocky Mountains to you. Each piece is as unique as nature intended and features our limited lifetime warranty. 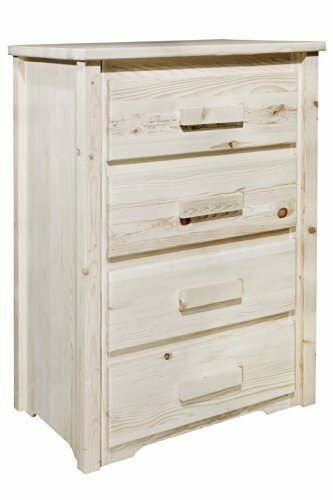 Shopping Results for "4 Drawer Log Chest"